Prepare herb spread by combining mayo, garlic, basil, and dill. Cover and refrigerate. Place strips of bacon on a cookie sheet lined with foil. Place in cold oven. Turn oven to 400 degrees and set the timer for 17 minutes. When timer goes off, remove cookie sheets from the oven and transfer bacon to a paper towel lined plate (allow grease on foil to cool completely). 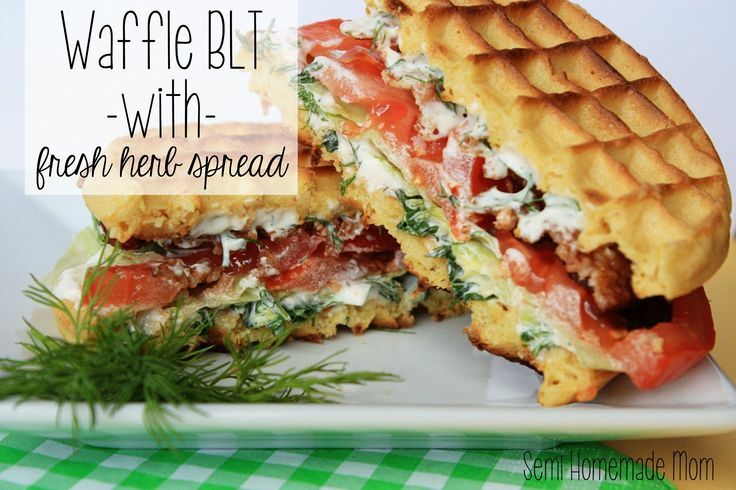 Prepare sandwiches by spreading 2 tablespoons of herb spread on each waffle. op with another waffle. Serve immediately. Chop waffles into small pieces. Place waffle pieces in a pie plate place in oven set timer for 15 minutes. While waffles are in the oven brown the ground beef add in tomatoes, drained pinto beans, and taco seasoning let simmer and reduce, use spatula to break up large pieces of meat and break up beans. When waffles are done remove meat from stove top and spoon over waffles, cover with cheese. Place back in oven for 10-15 minutes or until cheese is bubbly and starting to brown. 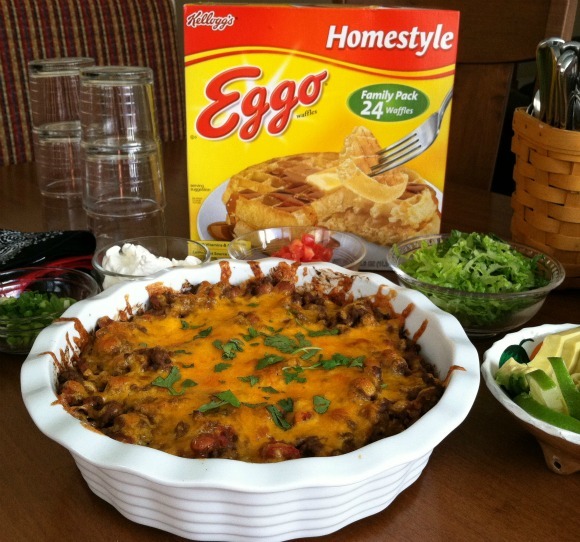 Cut into 6 pie shaped pieces and serve with taco fixings. Cut and wash fresh fruit. Mix together cream cheese, sugar, and vanilla. Spread cream cheese mixture on toasted waffles.